The latest and last sequel 'Infinity Blade 3' has the first game to make use of the newly launched iPhone 5S specifications to the max. Infinity Blade developer Chair Entertainment, which is the studio under Epic Games, the publisher of Infinity Blade had stated this. Now Epic Games has published the Infinity Blade III for all iOS devices. But do remember that the game will work best on iPhone 5C and iPhone 5S to be launched by Apple. Chair Entertainment has that the new game, Infinity Blade III, will leverage the power of the Apple's newly launched iPhone 5S with A7 to give you better results and more gory graphics. Infinity Blade III will use the 64-bit chip architecture and the OpenGL ES 3.0 to give you stunning graphics, game play and maps. The game play in Infinity Blade III is the same, you have to fight the enemy one on one. You can dodge the attackers, have time attacks and cast magic on your enemies. The Infinity Blade III will have eight new worlds to explore and as said above, the developer will make full use of the 64-bit A7 processor to give you stunningly designed maps to explore. 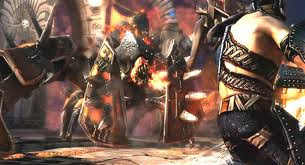 Infinity Blade III will have two characters Siris and Isa, you can chose either of them depending upon your choice because each will have his or her own unique fighting style and weapons/items to use. Chair has added a new feature in the Infinity Blade III which is called the 'Hideout'. Hideout is a place where your character can rest for a breather, carry out recruitment activities and think about further options available for survival. Chair Entertainment has also brought back the ClashMob challenges with three new modes inviting gamers from around the globe to team up for unique “massively social,” crowdsourced and group-based challenges to unlock rare treasures and earn exclusive items. Infinity Blade III will also feature a new prologue called Infinity Blade: Origins, created by award-winning director Ben Hibon (Harry Potter and the Deathly Hallows: Part 1, Mirror Mirror) and featuring actor John Noble (The Lord of the Rings, Fringe) as The Worker of Secrets. The game will cost you $6.99 (Rs.441.00) and is available for all iOS devices here at Apple Store. Remember that Chair also announced the Infinity Blade III will be last of the trilogy and will again be powered by the Unreal Engine. If you have played Infinity Blade series earlier than you will know that the game is about love, honour, betrayal and redemption much like the ongoing popular television series "Game of Thrones" available on HBO.